IT was a closer affair this time with the Wilson rink winning 9-5 after eight ends. 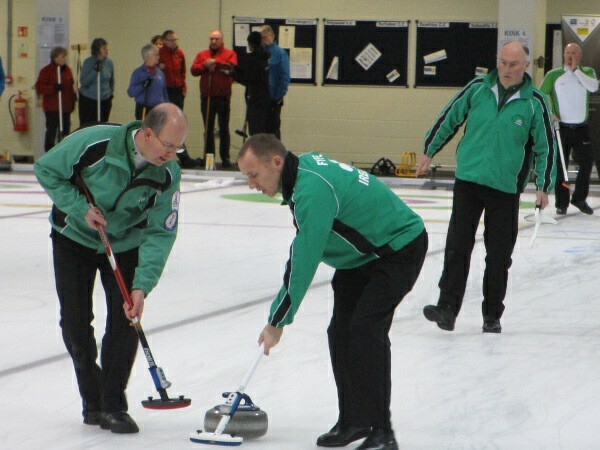 Kenny, with Tony Tierney in at lead, took a 5-2 lead after scoring two in the fifth, but an ugly end for them at the next saw Wilson pouce and take a big three to even the scores at 5 all. The seventh end saw Wilson team take a two shot lead after the Kenny crew had a succession of ropey shots. Kenny had last stone and with Wilson lying shot, but open, in the top four foot, JJ ignored the chance of taking a one, electing instead to hit his own stone, frozen on top of the Wilson second shot at 11 o’ clock on the twelve foot. If he removed the Wilson stone he would go into the last end one down with hammer. That was the plan. But as we can’t see on the webcam link, we can only assume the stone must have picked up as it was last seen heading fo the adjacent sheet. In the last end, JJ was left with a difficult triple to get his two and take this match to an extra end but it didn’t work out and Wilson took a two for the 9-5 win. So….. to use the terminology of the only sport I know hee-haw about; this is a grand national not a 2,000 guineas and we could well be heading for a photo finish tomorrow afternoon.